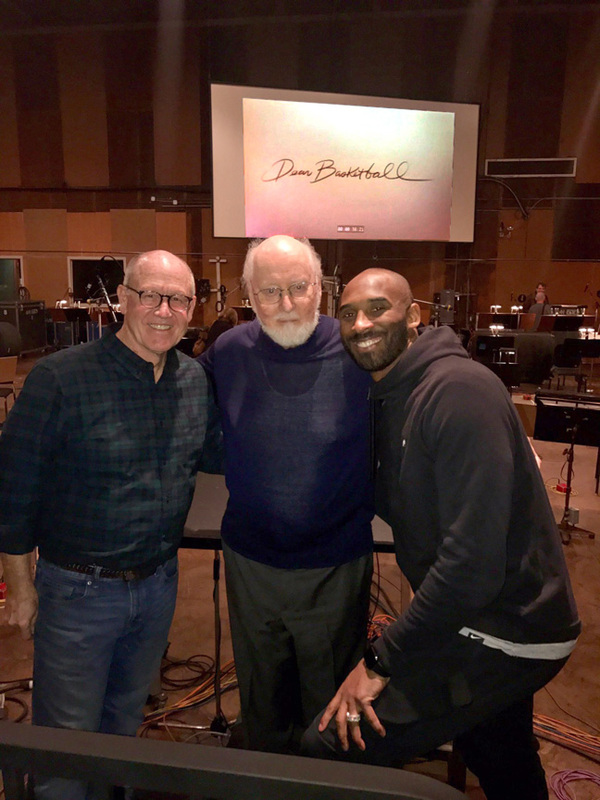 LOS ANGELES—Dear Basketball, the animated short about Los Angeles Laker star Kobe Bryant with music by composer John Williams, makes its concert debut this weekend at the Hollywood Bowl. Williams will conduct it live-to-picture with the Los Angeles Philharmonic Friday, Saturday and Sunday nights. As Williams explained recently: "Two to three years ago, I received a call from Kobe Bryant, asking if I would have lunch with him. I had known him, of course, as one of our country's greatest athletes. But as someone who had never seen a professional basketball game, I thought, 'Well, this is something quite extraordinary.'" "Kobe can apparently call anybody in the universe," quips animator Glen Keane, who drew and directed the five-minute short. "He called John to talk about how he does what he does. They became friends and, when it came time for Kobe to retire, he knew he wanted to do this as an animated short. He talked to both John and myself to see if we were interested." Bryant penned Dear Basketball, a short poem, in 2015 as his farewell to the sport. Keane – a longtime Disney cartoonist whose character animation helped make classics of The Little Mermaid, Beauty and the Beast, Aladdin, Pocahontas and others – began work on an animated version in the spring of 2016. "Right from the beginning," Keane said, "Kobe really wanted this to feel as hand-crafted as possible. So it was very important that this be hand-drawn with pencil. It was very textural in style, more of an artistic statement. So it was also very important that [for our composer] we have somebody who's not just using a synthesizer, but real instruments in an orchestra. Something very personal." Photo and sketch by Glen Keane, captioned "Kobe Bryant closes his eyes and listens for the first time to John Williams beautiful and emotional score for Dear Basketball." The process of drawing and animating the film took about nine months, Keane said. Detailed discussion about the music began in January 2017, and the score was recorded in March at the Sony scoring stage. Bryant and Keane were both present for the recording. Williams was in the midst of writing the score for the upcoming Star Wars: The Last Jedi and, as he says, "interrupted my work on Star Wars to write this piece for him. Kobe very generously provided an orchestra with which we could record the music." Says Keane: "It was pretty wonderful to think that the Star Wars orchestra was being used for this short but very emotional little film on Kobe's amazing life. John really supported what I was trying to do with my animation, and what I thought Kobe delivered in his narration. I guess I'd use the Italian word 'sprezzatura' – it's a term that means 'art that hides its art.' His work lifts you emotionally, so you are really experiencing all the power of his music without him standing center stage." As Williams put it after the recording: "What's important about this film is that it tells us that Kobe's life is meaningful, contributive, and finally inspirational. Not just to young people who aspire to athletic careers but to people in general, of all ages."